You are invited to an exclusive night of music and FILMING of the Northwest’s Best Original Rhythm and Blues Band! Friday night Aug 3rd, from 9 to midnight THE MARK DUFRESNE BAND featuring Billy Stapleton” will be filming and recording a 3 camera shoot of their best material. They have chosen Bake’s Place for it’s outstanding room acoustics, stage and lighting. This is going to be a PARTY!! Tell your friends, it will be a barn burner! Mark Dufresne is a Grammy Nominated Tenor with 3 octaves of vocal power. In addition, his award winning harmonica playing will knock you out! WA Blues Hall of Fame guitarist Billy Stapleton shows off a wide range of lead and slide guitar all night long. Backed by a solid rhythm section of Guy Quintino on electric and upright bass and the effervescent David Hudson on drums. Make your reservations now, don’t miss this one! Bluesman Mark DuFresne has a long list of accolades. The Washington Blues Society has awarded him the title of “best vocalist, songwriter and harmonica player” more than any other artist to date. Mark spent four and a half years as the lead vocalist and front man for the Grammy-nominated band Roomful of Blues. 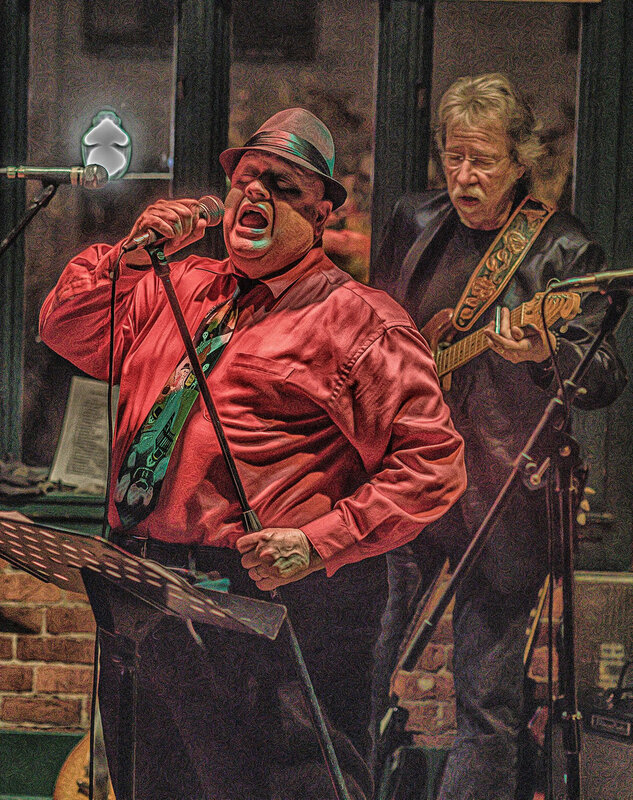 During that tenure, the New England Blues Society named Mark the Best Blues Vocalist. Mark returned to the Northwest in 2006 and has been working steadily throughout the region. Mark has also performed abroad and most recently toured Europe with some of Italy’s most well-respected musicians: Maurizia Pugno, Alberto Massico and Gio Rossi. In addition to his outstanding vocal chops, Mark’s command of the harmonica is equally high octane. He is known for his innovation and fire. In the words of Blue Review Magazine, “DuFresne is as distinctive as a vocalist as he is a fiery player; rather than recycling old riffs, his original compositions are tuneful, melodic and grooveworthy.” We are always happy to welcome Mark back to the Bake’s Place stage.